Bertha married local railwayman Christopher Watson in 1904. After various postings with the LNER he became a signalman at Hougham and they lived in a cottage at Hougham Station. Bertha’s father David Spencer was living with them when he died in 1937. Bertha died there in 1945. Christopher died 2 years later at Hall Cottage, Marston; the home of his daughter Lilian Wiltshire. Thomas moved to Orston, then North Scarle. Earnest was living at home in 1911 (age 22) and working as a farm labourer. In the Great War he volunteered for the Army and was wounded twice in the first 2 years. The second time was during the 1916 Battle of the Somme when he was seriously injured when his dugout collapsed due to shelling. He died in Marston aged 70 in 1958. In 1911 William was working as a farm waggoner at Hollins, Old Brampton, near Chesterfield. He volunteered for the Army but was seriously injured in 1915 and invalided home. 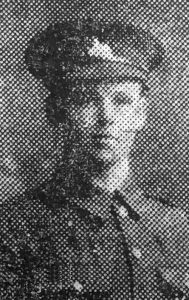 Leslie joined 7th Battalion, Lincolnshire Regiment. They landed in France in July 1915 when, after a period of trench familiarization, they held the front south of Ypres. After the German attack on ‘the Bluff’ in Feb 1916, they moved to Armentieres, then to the Somme. The ‘first day of the Somme’ (Battle of Albert) was 1st July 1916; Leslie died 3 days later, although he may have been wounded earlier as he’s buried at Heilly Station Cemetery, Mericourt l-Abbe (near Albert) which was the location for a casualty clearing station during the battle.